Establishing worthwhile work habits, persistence, independence, time management and an appreciation of the value of learning itself begins early in the schooling process at NPS. Learning is structured to empower the students to share their thoughts and ideas. The Curriculum is designed to encourage team work. 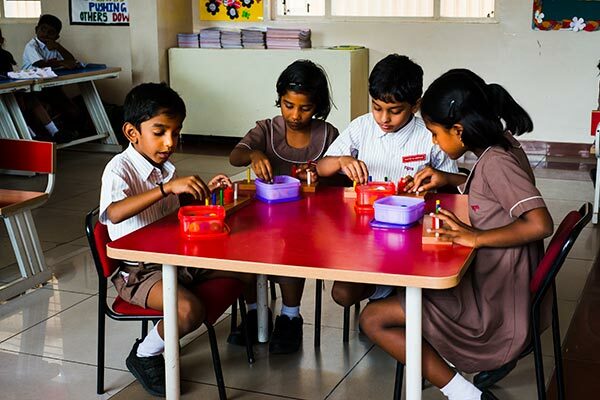 Learning takes place through group discussions, projects as well as hands-on activities and experimentation. Emphasis is laid more on 'learning by doing' rather than rote-learning. Our teachers act as facilitators and guides throughout the learning process. CBSE has introduced a revised assessment scheme for Grade X from the academic year 2017-18. It comprises 80 marks weightage for the Board Examination (full year’s syllabus) and 20 marks weightage for internal assessment. Visual and Performing Arts, Physical and Health Education, Yoga and Work Experience are also compulsory. Discipline – attendance, sincerity, behavior and values - has been stressed upon and students will be graded on a 5-point scale. For the purpose of uniformity, the same assessment model will be replicated for Grades VI-IX. The Kindergarten is a dynamic environment in which we see significant developments in physical, emotional and intellectual growth from the formative years to graduation. These are the ‘Foundation Years’ during which early linguistic and arithmetic basics, scope for creative play and expression, physical fitness and constructive socialization are stressed upon to build childhood competencies. This is the time when good habits are instilled and a sense of identity and place take shape. Great emphasis is laid on a child's all-round development. For us academics is as important as extra-curricular activities. We work towards bringing out the latent talents of our children and hone their skills so that they achieve perfection in their respective spheres. There is a thoughtful balance between teacher-directed work and child-directed activities. Our children form attitudes about learning that last a lifetime. It is not surprising therefore that our children remain adventurous learners throughout their lives. 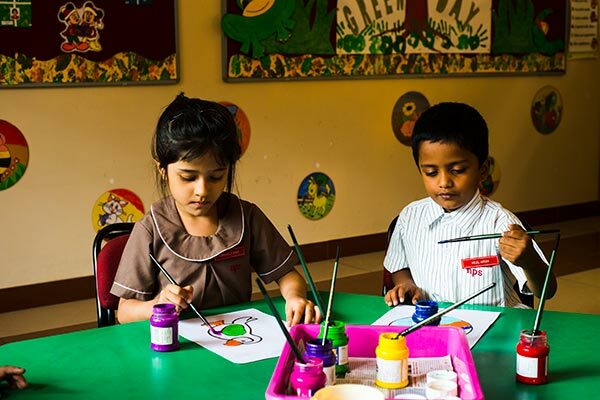 Storytelling, poetry recitation, singing, drama and dance are also a part of the Kindergarten programme which help enhance classroom learning. Emphasis is placed on understanding the child; his concentration levels, memory, reasoning and creativity. A system of “Continuous Informal Evaluation”, based on class work, theme-based worksheets and observation sessions is followed. As students move to and through the primary school we introduce them progressively to the world of integrated knowledge, while particularly strengthening their aptitude in the core subjects like English, Hindi, Mathematics, General Science and Social Science. As a stimuli for reading and writing, from Grade 1 our students are introduced to the study of computers, appreciating that computer literacy is essential in the modern world. Children also start using the Math Lab materials from Grade 1, which help them sharpen their analytical skills. We encourage students in the primary school to do various projects in Environmental Science to create awareness about conservation of natural resources and the need for a clean and healthy environment. They learn to appreciate history, geography and the cultural diversity on Earth. A well structured Writing Programme is also introduced in Grade 1 which is followed up to Grade 8, to train students to become skilled writers. In Grade IV, Story Writing sessions are conducted where students are encouraged to hone their creative streak. Their stories are published and the young ‘authors’ feel enthused to pursue their newfound interest. National Public School has introduced a pilot project- Guided Enquiry Based Learning (EBL) for Grades 2-5, an innovative process of learning in Science and Social Science, which find its basis in the constructivist theory of learning where the learner takes ownership to build knowledge and understanding of a given topic or theme. Learning through Enquiry is triggered by student questions fuelled by a child’s natural curiosity. In Grade 5, students are taught to handle larger portions than what they tackled in Grades 1 to 4. Along with English, Mathematics, Hindi, General Science and Social Studies, Sanskrit/ Kannada is introduced as a third language, as part of the three language system recommended by CBSE. Stepping into the Middle School, our students are ready to face more challenges and do an in-depth study in all subjects - Mathematics is split into Math-I and Math-II. To stimulate the spirit of enquiry and learning in the Middle School, students are engaged in investigatory projects in Math. The topics range from Algebra to Geometry pertaining to their level. General Science is split into Physics, Chemistry and Biology and Social Science specializes as History-Civics and Geography. English, Hindi, Kannada or Sanskrit and Computer Science continue to remain as part of the curriculum. As students progress through the senior years, we expect them to become increasingly independent learners with an interest in setting personal academic goals. It is our belief that regular guidance and testing provide young students with the self-discipline and confidence to handle more advanced senior tasks. Building self-esteem, self-respect and the courage to explore are qualities we seek to reinforce in our student body. Keeping in mind the shifting trends of education, we offer a curriculum, which emphasizes activity oriented teaching and creates opportunities for the children to observe, explore, analyze and conclude thus making them independent learners. The interactive board turns a typical classroom into a fun learning environment. It enriches classrooms by providing hands on collaboration and creating the perfect learning setting. Co-curricular activities complement and enhance the academic structure of the school. The School follows the CBSE curriculum and from Class IX students use the NCERT textbooks for the Languages and Social Science. Science and Mathematics follow an autonomous syllabus formulated by the school. The subjects include English, Science, Social Studies, Mathematics, Sanskrit / Hindi. Environmental Education, PHE, Yoga, Work Education and the Visual & Performing Arts are part of the curriculum. Our teaching is aimed at helping Grade XI and Grade XII get admission in the best universities across the globe and in India. In a curriculum that is balanced between Science, Mathematics and Technology, it also allows students to pursue those subjects that will satisfy any university entrance requirements including Engineering, Medicine, Dentistry, Law and Business. It is our strong belief that students who complete our programmes will be prepared to embrace the brilliant opportunities of a new century. The assessment in Grades XI and XII is done on the basis of unit tests for Grade XI as a regular feedback on academic performance. Grade XI has Half Yearly and Annual Exams. Promotion to the next class depends on the performance in the annual exam, as per the criteria laid down by CBSE. 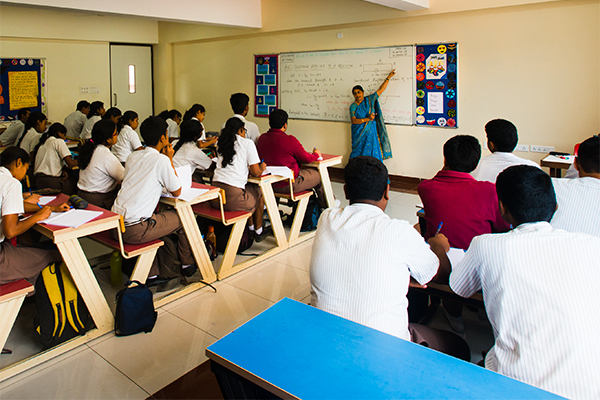 Grade XII has regular class tests, followed by half yearly exams. They have an examination at the end of the calendar year followed by Pre-Board Exams. Grade XII appears for the All India Senior School Certificate Examination in March-April conducted by CBSE. The culmination of schooling brings with it heavy demands in study, games, leadership and very often, social life. The capacity to balance these pursuits is very important and we are sure that our senior students embrace the meaning of their school motto in its completeness: ‘Reach Out, Reach High, Reach Beyond’ as a way forward to achieving personal goals and happiness in life.